The No.2 windlass body provides a robust platform for a wide range of specification options. The No 2. windlass is for use with vessels of around 25 to 45 tonnes. The view above shows the compact gear arrangement in the dual ratio specification windlass, in this case with iron body, and bronze capstan/gypsy. Dual ratio, two external hand wheel operated brakes, dual gypsy and capstan both sides 174.66 Kg. A detailed specification sheet showing dimensions, weights, interface information and installation instructions will be downloadable from this site shortly. *With dual gypsy and capstan, windlasses must be fitted with two hand wheel operated brakes and a clutch mechanism fitted to both sets of gypsy/capstan. This is to facilitate independent operation. Made in iron, and in single ratio work boat trim, the No.2 windlasses start at £3500 and increase in specification and price, to a bronze single ratio windlass for around £5750 and then through to a bronze dual ratio variant with two external hand wheel operated brakes, gypsy and capstan both sides, with clutches both sides to facilitate independent operating. These higher specification No.2 windlasses cost around £11,900. Please contact us through: sales@deepblueengineering.co.uk or tel: 07576363578 to discuss specifications and prices. Deep Blue EDU. 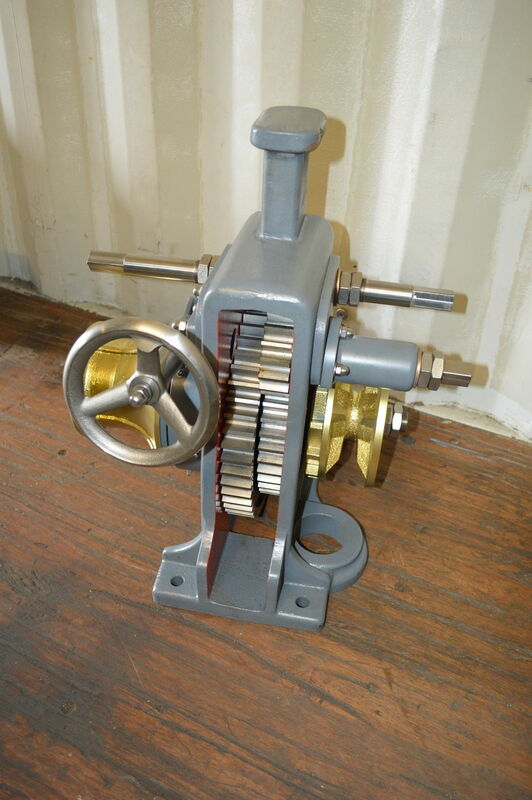 Powering a manual windlass. Our manual windlasses can be powered using a Deep Blue EDU (electric drive unit). The EDU consists of an electric motor and gearbox. The manual windlass can be supplied ready to accept an EDU, or an adapter kit can be suppied along with the EDU in order to add a power capability to an existing manual windlass. The specifications for these units vary; motor voltage can be 12 V, 24 V DC or 110 V and 240 V AC , gearbox ratios can deliver a range of RPM/torque to the main shaft (gypsy and capstan). To specify a suitable EDU, please contact us or let us know you require an EDU at the time of purchasing your windlass, and we can build the EDU you need. Prices for an EDU are around £850 + VAT. They are housed within a hard case for stowage. When the EDU is needed, it is attached to the windlass, by slipping the female gearbox drive over the windlass input shaft, then securing a torque arm, which also forms part of the EDU, to the windlass body. The installation and removal after use, take less than a minute. The EDU is relatively lightweight, ranging from around 8 Kg for the smaller windlasses, up to 16 Kg flor the large windlasses, depending on the power requirement and motor type. The Deep Blue EDU can be used with any manual windlass. Provide us with details of the input shaft profile and we can supply an adaptor and EDU for existing, older windlasses. Photographs of an EDU and links to footage of the EDU being operated will be added to this website shortly. Windlasses made with integral power units, either electric or hydraulic, will currently be made to order, to meet a customers' requirements. 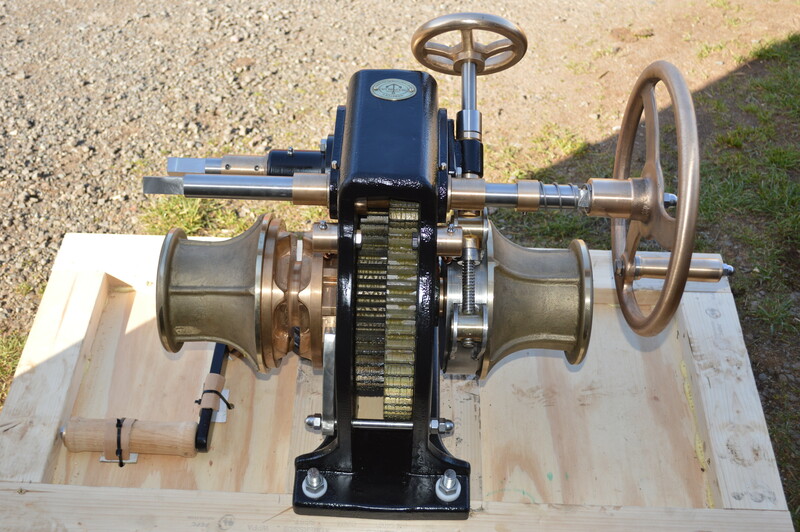 The manual windlass capability remains fully functional, with no compromise when a motor is fitted. 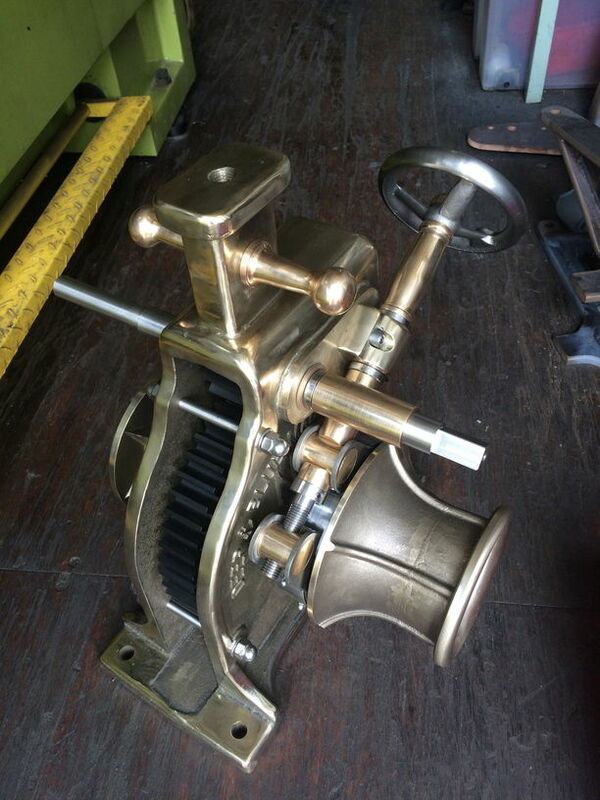 The appearance of the windlass is not dramatically affected either, retaining a traditional appearance. The motor and gearbox can be positioned below deck with a drive running vertically up into the windlass above deck, or a motor and gearbox can be mounted above deck as an integral part of the windlass.